The rise of superstar boy group EXO led to a vigorous change in the K-pop sphere. Before, the market had been ruled by juggernauts such as Big Bang, SNSD, 2NE1, Super Junior, TVXQ, and many more. However, long hiatuses and ever-changing market gave EXO the perfect opportunity to come and smash some new records with their million selling album XOXO and the viral smash hit “Growl”. After this, new groups began to take the K-pop scene by storm. Physical sales improved for some key boy groups and with TWICE’s rise in 2016, the new generation girl groups began to replace the older ones. One would think that such an event would be exciting for any K-pop watcher. As the old adage says, “out with the old and in with the new”. However, another adage has proved to be more than relevant in this case: “nostalgia is a powerful drug”. 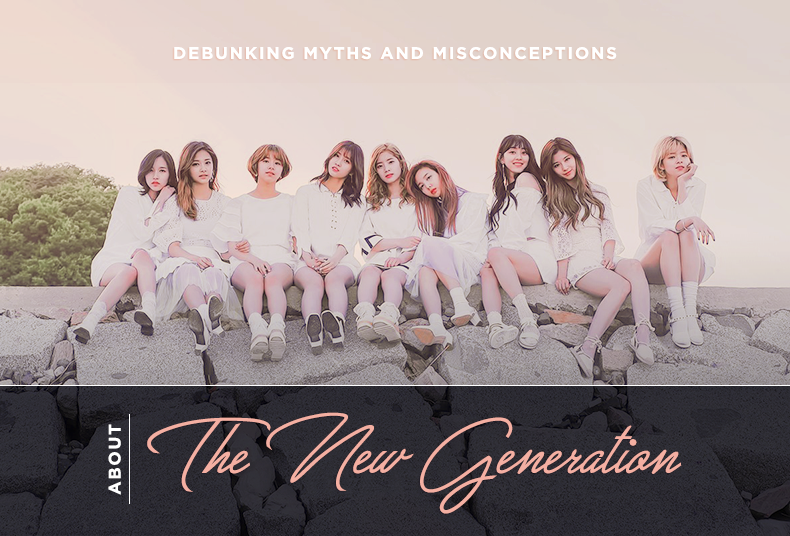 Instead of fully welcoming the newer groups with open arms, several myths and misconceptions have sprung up. This is not to say that the 3rd Generation idols do not have any fans as that would be quite insincere. It is to be noted, though, that many fans of the older generation groups have come up with less than fair critiques to write off the new generation. Thus, it is my goal to debunk these myths and misconceptions as they paint a very unfortunate picture of the current market. This might come as an apologia of sorts and perhaps it is, but the new generation idols need to be defended and this is one of those times. It cannot be stated just how many times I have seen this argument. It has especially become prevalent in the last year especially with the rise of the current top girl group, TWICE. While the older generation had a wide talent pool, stating that the new generation is severely lacking in comparison is quite unfair on many levels. It depends on the idol in question. This whole myth is a gross over-generalization that takes into account maybe 5% of the currently active 2nd Generation superstars. People who propose this myth as word of god always leave out the hilariously large amount of 2nd Generation idols who are untalented, just as they ignore those 3rd Generation kids who are. Even then, those 2nd Generation idols who are good now were not always as they are. Some of them (like SHINee’s Taemin) were barely able to sing a tune but managed to overcome this through hard work and sheer tenacity. Others like Taeyeon started out barely above average but improved over time. The key factor here is time. 2nd Generation idols had time to hone their crafts, and lots of it! Groups like SNSD, Big Bang, and Super Junior have been in the industry for a decade or more. It is unfair to compare any one of these idols with those who have only been around for two or three years. Even groups like EXO and BTS are still fairly young in comparison. Stating that the new generation is talented is different from showing that it does have some great promise. Thus, it is my goal to provide, as we say, ‘receipts’ to prove my point. I will start with the vocalists. The current top vocalists for boy groups, soloists, and girl groups are all from the 2nd Generation. Super Junior’s Kyuhyun is currently unmatched, and so are f(x)’s Luna and Ailee. However, there are a couple of young idols who show great promise. Shannon is a British-Korean singer who first came into the public eye through Star King. Since then, she has worked overtime to cement her status as a viable soloist in the market. Sadly, she does not sell nearly as well as she should but this does not stop her from consistently giving us near flawless vocal performances. This is her at only 16 years old. Despite her young age, she sounds as if she’s been in the industry for years. Now that we have covered the best soloist of the new generation, we move onto the best boy group and girl groups vocalists, a.k.a Chen and Wendy (surprise, surprise they are both from SM). While neither are on Shannon’s level – yet – they both bring something new to the scene. Chen currently has the most developed lower register among all tenors and Wendy has one of the most developed head voices in the game. In fact, both go toe to toe with older vocalists and both can be placed in the top 5 overall rankings of either category. The three vocalists mentioned above are not the only skilled ones. To save time, I shall not provide videos and analyses for all of the current top new generation vocalist. The point is, there are many still left. EXO still has Baekhyun and D.O, Gfriend has Yuju, Oh My Girl has Seunghee, Seventeen has Seungkwan, and Mamamoo’s entire vocal line is one of the best in the industry. Either way, the vocal talent pool for the 3rd Generation is just as wide as the old generation and given time, will soon surpass it. P.S: More performances to note are Mamamoo’s Immortal Song performances. Here is one of the best ones. But vocals are not the end all be all and there are still other talents to be considered. Rapping is an underrated skill, yet we always appreciate a good rapper when we come across them. It just so happens that there are quite a good number of skilled rappers in this new generation. Monsta X’s Joheon and I.M show a lot of promise, so do Seventeen’s Vernon and Mamamoo’s Moonbyul. However, there are four rappers in particular who have exceeded all but one of the older generation’s rappers; of course this is debatable. Either way, BTS’ Rap Monster and Suga, Winner’s Mino and iKON’s Bobby are very skilled despite being in the industry for a relatively short time. BTS, in particular, packs quite the punch when it comes to rap. Rap Monster and Suga are both highly skilled but different enough to not cause repetition within the same group. The cyphers (usually including the group’s third rapper J-Hope) are some really good examples of just how talented these boys are. All of them are good but it is the second cypher that truly highlights the group’s strengths, uniqueness, and differences in style. YG has always been known to have the best rappers. Upon much retrospection, K-pop fans came to the realization that this is not quite true and only holds weight when compared to the other two companies within the Big 3. Then came Bobby and Mino who shattered the “YG rappers are overrated and do not have much skill” fad that had taken hold of the fandom. As is the case with BTS, these two rappers work very well together but they still manage to keep their own identities. What they lack, however, are the strong production skills that Block B’s Zico has or the musical genius of label mate G-Dragon. It is still too early to write them off though, and the only way to go from here is up. P.S Other rappers to take note of are B.AP’s Zelo and Yongguk. The last talent that I will speak of is dancing. Now the 2nd generation, in particular, had some of the best dancers K-pop has ever seen. Jay Park, Taeyang, Taemin, Hyoyeon, Min and Jia, U-Know, Eunhyuk, and many others were dancing beats. It is hard to come up with any 3rd generation dancers that can truly match these machines but there are some who could get there in the future. Oh My Girl’s YooA, Red Velvet’s Seulgi and TWICE’s Momo are among the best new generation dancers. Many might find it hard to compare them to legendary dancing machines such as Hyoyeon, Min, Jia, Kahi and others but they have shown a willingness to improve and a passion to learn new styles. Of course these are not the only skilled female dancers. Gfriend’s SinB is also pretty good, so are Red Velvet’s Irene and BLACKPINK’s Lisa. It all really depends on how much time one is willing to spend to list all the competent idol dancers. The boys are just as talented. In this case, we have groups with three or four talented dancers. The ones mentioned above are not the be all end all. Other such as Seventeen, B.A.P, GOT7 and iKON also have very strong dance lines. While it seems prevalent to write of the 3rd Generation idols as disappointments, it cannot be further from the truth. Every year has brought forth some great talent which debunks the idea that this generation is severely lacking compared to the previous one. Ah, nothing is worse than using absolutes to describe entirely subjective notions. Somehow, the idea that the new generation has brought nothing to the table is a sentiment that has taken hold of the greater K-pop community. Time and time again, someone will state with the utmost certainty that the older generation was completely unique while the new one suffers from the inability to bring forth original content. Many also claim that there is little to discern the younger groups as they are all doing the same concept over and over. Now this notion, while unfair to the newer idols, ignores several complex issues that have made the K-pop market different now than it was six or seven years ago. The market is over saturated now: more groups have debuted in the last year than they did in the later 2000s and early 2010s combined. With almost 100 new groups debuting each year, it is expected that concepts will be re-used more than once. This is of no fault to the groups, themselves, but a mark against the companies that choose to pump more groups into the system (fully knowing that 90% or more will fail in the long run). Companies are sure to re-use a formula when creating a group. When it comes to those with a considerable roster of acts, it is not surprising that the executives would create a new group in the image of an older one. To be sure, this is not always done properly but when it is it creates an interesting and exciting dynamic. Second generation idol groups were known to re-use concepts done by the 1st generation. They also did adopt different styles, especially from the west. Arguing that the new generation relies on hooks to get hits is disingenuous, considering the fact that most 2nd Generation group hits were not complex musical structures and focused on repetitive hooks to enthrall the public. Either way, the new generation has various groups that have shown an ability to put out well produced music on the regular. Whether it is by their own doing or the company’s, several have built strong discographies over the years. Red Velvet is one such group. This five member ensemble from SM entertainment was meant to combine all the best elements from SNSD and f(x) into one unique group. Thus came the distinction between the group’s two primary concepts: Red and Velvet. Their ‘red’ side is upbeat, quirky and trippy, bold, and colorful. No one song that is thoroughly ‘red’ sounds the same as the other. It is also the side that is most popular with the Korean public and the fandom. For the best ‘red’ song, I would recommend “Dumb Dumb” or “Red Flavor”. Other wonderful tracks are “Ice Cream Cake” , “Russian Roulette” and “Happiness”, all of which combine various different and hard hitting properties to create one amazing track. The ‘velvet’ side on the other hand is more feminine and sultry. Whereas ‘red’ was bold and daring with elements of electropop, trap, and dance pop, ‘velvet’ is more R’n’B and works solely to showcase the group’s vocal line. The best received ‘velvet’ track is “Automatic”, a 90’s R’n’B pop song with strong visuals and choreography. And Red Velvet’s unique style is not solely reliant on stand-alone stand-out title tracks. More often than not their b-sides are even better than the title. “Rookie” was considered to be disappointing by many, but the album itself was very well produced. However, the two albums that every fan should listen to are The Red and The Red Summer. To prevent this from becoming a Red Velvet appreciation post, I must move on to the next group. Mamamoo is a four member group that debuted around the same time as Red Velvet. While the former quickly established their weird and quirky style, Mamamoo from the get go was a group that focused almost entirely on the retro sound. This sounds a bit boring but every single album they have released has been very different from the last. What Mamamoo did best was to work around the retro concept. It seems like they might have been backed into a corner for sticking to one style but so far, it has worked wonderfully. They have combined the concept with 90s hip hop, R’n’B, modern pop and so much more. One of their best albums to date, Melting, is a perfect fusion of various different styles to create one cohesive sound. What makes this group even more special than it already is its ability to put their own spin on other artists’ work. Mamamoo has one of the strongest vocal lines in K-pop and the girls use this fact to enhance their musicality and musicianship. Take a look at this medley. It incorporates one of the group’s own songs and then uses hit songs from other artists to enhance the live performance. It is this fundamental understanding of the art that makes this group one of the best in the industry. There are other new generation girl groups with wonderful music apart from the two mentioned above. Oh My Girl has consistently put out well produced and unique music and it looks like BLACKPINK will follow in 2NE1’s footsteps. Even then, there are boy groups with good music as well. EXO has some well done albums with EXODUS and the recently released The War being among the best they have ever released. Winner, despite having very few comebacks, has also been incredibly consistent in what they release. Yet I would like to focus on two groups in particular that have not had the privilege of working with a stream of resources. The first group that must be mentioned is Seventeen. This group had one of the most anticipated debuts and finally delivered in 2015. When they did, Pledis was at its lowest due to a string of bad decisions. Not only did Seventeen give new hope to the company, but they also made the race to the top all the more interesting. Their first two albums, produced and choreographed entirely by the boys, were among the best début albums of the past few years. They have since changed their style, trying EDM and even funk but they have never lost their unique touch. Another group that has consistently put out great music with even more variation is BTS. Debuting in 2013 under the relatively small BigHit Entertainment, this group is the very definition of musical growth. They started off as a rap centered group and while their earlier releases were not perfect, they found their sound and improved on it which in turn allowed them to release some of the best music among K-pop boy groups. From the album Skool Love Affair to the very recent Love Yourself: Her, this group has tried everything under the sun: hip hop, EDM, pop, R’n’B, rock, and many more. Even while covering different genres, BTS has excelled in maintaining their own sound. Quite recently, they released a cover of Seo Taiji’s ‘Come Back Home’, showing that they have developed their musicality and are more than capable of paying homage to classics while providing a modern twist. This is not to say that the new generation groups have not released ‘bad’ songs as there are quite a few examples. However, there are groups that are constantly putting out the best that they can. Others like VIXX have also been releasing diverse and well produced content. With all this said, there are many things that the K-pop fandom can look forward to. Sure the market is quite saturated but on the bright side, there are many different groups with different sounds out there. Certain concepts do get used by many, but it is possible for these groups to put their own musical color on them. For example, Red Velvet and Gfriend both follow the cute concept but to varying degrees and no one song sounds the same between them. Seventeen and EXO both follow a more poppy sound, yet their discographies are vastly different. iKON and BTS also have very different sounds, even though they are both hip hop oriented groups. It is understandable for many 2nd generation fans to be nostalgic, but it is also unfair for some of them to discredit the 3rd generation’s talents. Just because newer groups are getting popular does not diminish the accomplishments of their elders. For some reason, this has escaped many leading to a few unfair misconceptions to spring up within the fandom.